This hymn of the Church does not ‘belong to the Easter service alone. It enters into the makeup of the Sunday service of the Sixth Tone and is sung in its prescribed plaice each time this service is sung at Saturday vespers. But who of the faithful children of the Orthodox Church does not know how majestically and in what a completely special form this hymn is proclaimed on the Radiant night of Christ’s Resurrection? Before the very beginning of the procession and Easter Matins, with the altar still closed, the clergy sings this hymn; at the beginning, softly, as if from afar, and then all the more loudly and triumphantly sound the holy words, and at last - the Royal doors of the altar are opened, and the Easter Procession begins, in which the whole church takes part, processing with the sacred treasuries and banners as if to meet the Coming Conqueror of death and hell.. . . The holy fathers of the Church teach us that this procession reminds us of how the holy myrrh-bearing women “at deep dawn” - “while it still was dark” - hastened to the Sepulchre of Christ, so as OIYW more to anoint with fragrant perfumes the body of their beloved Teacher and Lord. But at the same time there is also an essential difference between our procession and the journey of the holy myrrh-bearers to the tomb. The holy women did not yet know of the resurrection of Christ the Saviour, and hastened to Him, as to One Dead, so as to show for the last time the signs of their reverence and devoted love. . . . But we go to Him as to Him Who has to arise as the Conqueror of Death, so as joyously and triumphantly to glorify Him Who arose and with Himself resurrects all! This is why, by an ordinance of the Church which has a deep meaning, it is directed to serve the Nocturns of Great Saturday before the ‘beginning of the Easter procession and even before the hymn cited above is sung. At this Nocturns is glorified the Accomplisher of our Salvation, the Lord Jesus Christ, still reposing in the tomb. For it was to Him, as the One in the tomb, that the holy women hastened, having not yet heard the wonderfully joyful news of His resurrection - The procession approxhes the Western doors of the church. But, they are closed - the procession stops before them, and there begins the most triumphant service in the whole Church year - the Radiant Paschal Matins. But this multitude of praying people gathered at the church doors with candles in their hands, in the midst of the deep night, does it not remind us of the Saviour’s parable of how the wise virgins hastened with lamps in their hands to meet the Bride-groom? 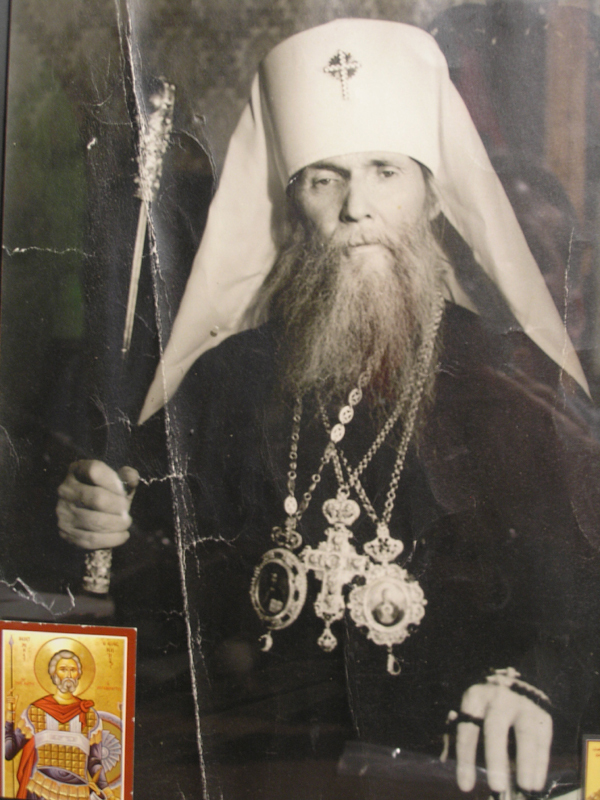 And at the same time, according to the deep thought of the wise Hierarch Philaret of Moscow, does it not also remind us that until the resurrection of Christ, mankind was forbidden entrance into the radiant palaces of the kingdom of heaven? Man-kind stands as if before the locked gates of paradise; “such it was until the resurrection of Christ, and such it would have been forever without the resurrection of Christ,” says the Great Hierarch. The triumphant Paschal service begins. “Glory to the Consubstantial, Life-creating, and Undivided Trinity,” exclaims the priest. “Amen,” reply those gathered - and for the first time thunders, so as to ‘be ceaselessly repeated afterwards, the victory hymn of the Resurrection of Christ: “Christ is risen from the dead, trampling down death by death, and on those in the tombs bestowing life. . . .” With the Holy Cross, three candles, and censer, the priest signs the shut doors - they open wide, and with the same victory hymn of the Resurrection, the procession pours into the Church - and now in the radiant, shining, and decorated church continue’ the Radiant Matins which began outside the church and in the dark of the night. . . . But let us turn back, to the very moment when the Church offered the Lord the, prayer that He would enable us to glorify Him with a pure heart - as His holy angels sing Him in the heavens. Are we capable now to glorify the Risen Lord from the whole heart and whole soul - so that nothing would hinder US in being completely given over to the radiant joy of the great Feast? Yes - once it was so! In the good old days, in Holy Russia. the feast of the Radiant Resurrection of Christ was celebrated as triumphantly as, perhaps, it was ever celebrated in any other land. The whole Russian people took this greatest triumph of our faith and hope namely as “the’ feast of feasts and triumph of triumphs,” and everywhere, in all the vast expanses of the Russian land, Orthodox people rejoiced over their Risen God and Saviour! But now, alas, we see something else. . . . Of course, even now there are faithful Christian souls devoted to the Lord, who are given over completely to the heavenly joy of the Great Feast, forgetting all that is earthly and not thinking of the misfortunes of the present life. But are there many of them? Do not many of us submerge ourselves in earthly vanity, in the cares and anxieties of earthly life, so much that even on the radiant days of Easter our soul turns out to be incapable of tearing itself away, of freeing itself from these things which bind its way to glorify “with a pure heart” the Risen Originator of Life? Yes, just as the sun, shining with all its strength, sometimes is hidden behind the clouds, and its rays do not pierce through the thick and dark cover of the clouds, so also the spiritual light, the light of the joy of the Greatest of our feasts, now turns out to be hidden from the children of earthly vanity, which blinds the man who gives himself wholly over to it. But this is not all. We cannot help but see how more and more the clouds are gathering on the civil and political horizons of contemporary mankind. With horror we see how falsehood in all its forms - falsehood in the political sphere, falsehood in the sphere of cultural understandings and values, and the most frightful, falsehood - spiritual falsehood - with its poisonous adulterations replacing Divine Truth, as all this is becoming more and more like a powder keg which can explode any minute. We see all this - and our soul is filled with horror before the misfortunes coming upon us, already threatening us, and the heart cannot forget about all this and be given over to the joyous and radiant experiencing of Holy Pascha. . . .
him for help and consolation. . . .
May the Lord grant us also the grace in these great and radiant days to be communicants of His joy! I S R I S E N ! To All Children of the Christian Church. One of the most striking phenomena in our days is that in recent years - before the eyes of all - of the weeping Icon of the Mother of God. Obviously - irrefutably - and inexplicably for any causes or explanations of the normal order of things, before the eyes of numerous witnesses of this extraordinary phenomenon, the holy Icons of the Queen of Heaven shed tears, and- sometimes tears of blood, as we more than once observed on one of the weeping icons which is usually in New York What is such a miracle for? What is its cause? What does it signify?. . . - One hears such questions one after another even from faithful persons when they observe this miracle or learn of it from others. . . .
And one recalls before such perplexing questions the words of the Saviour to His contemporaries - threatening, prophetic words: Ye hypocrites! Ye can discern the face of the sky and of the earth: but how is it that ye do not discern his time? Yea, and why even of yourselves judge ye not what is right? By these words the Lord convicted the people around Him in their hypocrisy - in their pretence - convicted them in that they, being very experienced and well-informed of the normal phenomena and conditions of life and understanding the cause and meaning of what was taking place before their eyes, in spiritual affairs were not only “lazy and incurious ” (words of A.S. Pushkin), but even covered up for their spiritual laziness and inaction by the impossibility, as it were, of understanding and comprehending the meaning and significance of the spiritual phenomena and facts to which they were witnesses. Such a supraworldly, uniquely tremendous fact was the very appearance on the earth of the Saviour of the world, His teaching and miracles! And yet once His contemporaries regarded Him such that St. John the Divine says of this matter - precisely and briefly: He came unto His own and His own received Him not.. . (John 1:ll). The Mother of God is weeping. . . . She is obviously and un-doubtedly weeping. . . . And if Her Divine Son, on His way with the cross to Golgotha, said to the women accompanying Him, who wept and lamented over Him: Daughters of Jerusalem, weep not for Me, but weep for yourselves and for your childhen do not these words now refer to Her to Whom He from the Cross gave as a son, in the person of the beloved disciple, the whole Christian race, and Who now weeps over Her children?. . .
“Why is the Mother of God weeping?. . .” people ask. . . . Are your eyes closed, or have you yourselves, according to the words of the Lord’s prophet, closed your eyes and stopped your ears, so as not to see and not to hear what is taking place in the world?! It is not enough that the Lord’s commandments are forgotten, and for contemporary “Christians” Christian moral conceptions of modesty and decency, of obedience to the Church, to her saving discipline and regulations, are in complete disregard; no, now we behold something even more horrifying and hideous, when in the expansion of so-called “ecumenism” a poisonous adulteration of Christianity and churchness is being offered to people, and at the same time obvious anti-Christianity is being legalized, and a “Christian” state, under the cover of a false under-standing of the word “freedom,” permits the open worship of God’s enemy, satan, in one of its great cities, as a permissible and lawful form of religion. . . .! And this is why the Queen of Heaven weeps over us.. . . A terrible sign ! And is it possible that this will not enlighten a world gone mad? Or are there already only a very few left in the human race who have eyes to see and ears to hear?. . . Lord! For the sake of the prayers, for the sake of the most pure tears of Thy Most Pure Mother - have mercy upon us and enlighten us.